How long will my site be hosted? Hosting lasts for 1 year. 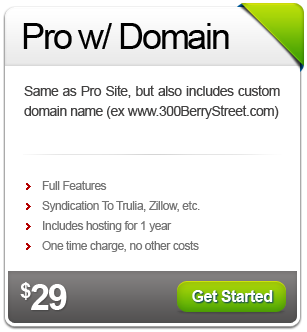 Do my property sites include a domain name? Can I order sign riders? Sign riders are available for $29, UPS shipping included. Will my site be linked from Realtor.com? If you have enhanced listings at Realtor.com your site can be linked free. Otherwise, it's an additional $20 per listing. Are there any setup or cancellation fees? No! There are no hidden fees, and you can cancel anytime. Do my property sites include free text marketing with call capture? Yes! Your sites include FREE text message marketing with call capture! Every property site generates a special text code that you can put on sign riders. When people text that code, they get a text message back with property info, and you get a text message with their phone number instantly! Contact Us and we'll usually get back to you within minutes. We also offer many custom plans, so please don't hesitate to contact us. FREE text message marketing with call capture! 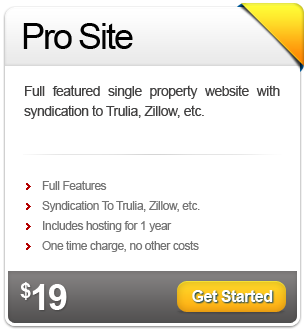 Syndication to Trulia, Zillow, Google Base & More! Full Color Sign Rider: $29, shipping incl. Copyright Resonant Properties, 2019. All Rights Reserved.